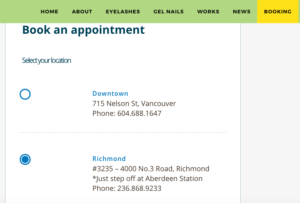 When you book an appointment via online please choose your location ( Downtown or Richmond ) at the final stage. Now our Richmond location is available on Mon-Fri 10am-6pm / Sat 10am-5pm. Or call us Richmond location 236-868-9233!! Currently we only offer eyelash extension service at Richmond.